Blood is constantly flowing through the veins in the body, and as you age, your veins need a hand to remain strong. 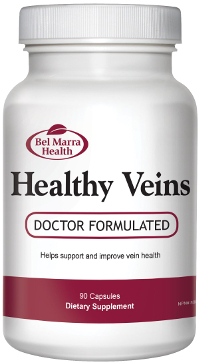 Healthy Veins is designed to give your veins that support. Healthy Veins uses a powerful combination of modern and traditional ingredients to help support vein health and circulation. Considering that veins play an integral role in your cardiovascular and overall health, it is important to help them stay healthy. For decades, the primary ingredient combination in Healthy Veins has been used in Europe to help support and promote vein health. This combination consists of hesperidin and diosmin, which are flavonoids that can provide essential support for healthy veins. In addition to hesperidin and diosmin, Healthy Veins includes vitamin C, grapeseed extract, and butcher’s broom to provide even more support for circulation and vein health. *non-medicinal ingredients: Gelatin, microcrystalline cellulose, magnesium stearate.